Grilling season is upon us, and what better way to kick it off than with some homemade condiments to complete your tasty burgers and hotdogs. 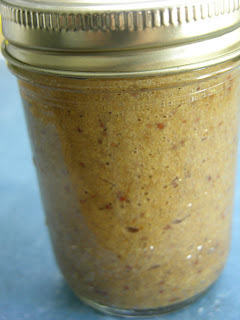 I’ll start off with mustard, which I made to top the corned beef for the St. Patrick’s day dinner (above). In the upcoming weeks, ketchup and a few others will follow. This recipe makes about 8-9 ozs of mustard, which I think is about the right amount for a two person family to use up in a reasonable amount of time. 1. Combine ingredients in mixing bowl, cover with plastic wrap, and let stand at room temperature for 24 hours. 2. 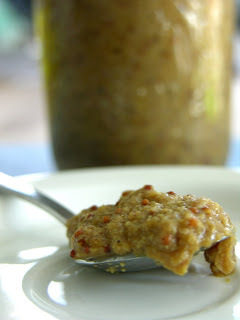 Pour mixture into a food processor and blend until mustard thickens. This takes about two minutes, if you like mustard with a chunky consistency. A minute or so more to thin it out more. Scrape sides with spatula if needed. 3. Refrigerate overnight before use, allowing the flavors to meld. Store in the fridge up to six months. The spicy flavor will continue to mellow with age. Yes! I've been wanting to make my own mustard for weeks now! This is just the inspiration I need!